October | 2012 | Run. Work. Live. Repeat. I went to the podiatrist today. Meet “Frankenfoot,” my new friend! “Frankenfoot” and I will be spending the next week together. That’s how long the doc wants me to wear Frankenfoot (a foot splint) to help my recovery. That’s my bad news. 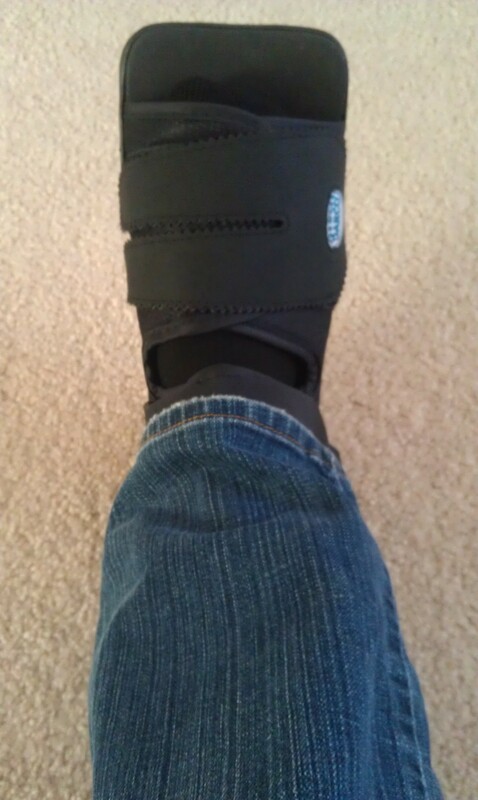 The good news: I’ve been doing everything right to heal my foot (at least, according to the doc). It’s simply taking its time, and he still thinks it’s metatarsal joint inflammation. I can continue to walk (using Frankenfoot), and pool run, swim and stationary bicycle. As if not being able to run it wasn’t scary enough — BOO!! It’s Halloween!! 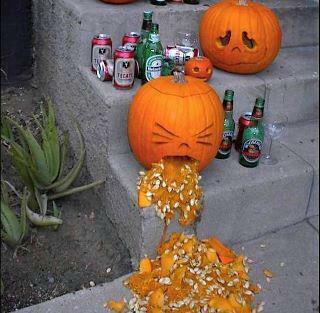 Have you ever eaten too much candy (or anything else?!) and ended feeling like this?! When I was a kid, my parents didn’t limit how much sweets we could eat on Halloween night and I can remember some of stomach aches that were doozies. Halloween is still one of my favorite ways to “carbo-loading.” I love chocolate but try not to keep too much around the house — it’s too much temptation, especially when I work at my computer on days like today. And now that I’m older and wiser, I also believe in moderation. Some runners work out so they can enjoy certain kinds of foods guilt-free. I’m definitely one of them — a run-to-eat, kind of runner. I don’t think I’m alone. On the dailymile.com, for example, the site has a statistic where it shows you how many donuts you’ve burned in the course of workouts. In my case I wish it could change it to “number of “Reese Peanut Butter Cups burned.” Those are my favorite treats at Halloween. What’s your favorite candy or Halloween treat? Have you burned off a few Reese cups yourself today? I’m off with “Frankenfoot” and my dog, Brownie, to limp out a few calories right now … I gotta get ready for tonight and those trick-or-treaters. Brownie Points Today: 2: Mileage for 2012: 1,159. 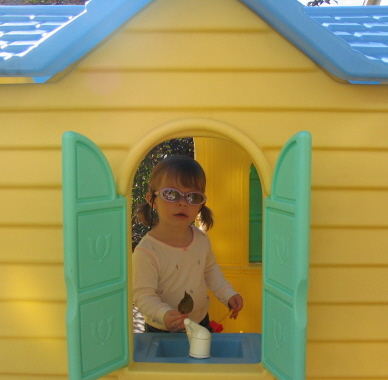 Yes, that’s my lovely, first born, way back when. Yes, that’s me finishing my first ultra, the Bear Chase 50K, with my sweet girl by my side, two weeks ago. This decade I gave birth to a new part of myself … a resilient part I didn’t existed until I tapped into it. Motherhood and marathons share many parallels. Once you become a parent, you remain a parent until the day you die. It doesn’t matter if your kids are grown and gone; you are forever changed; your children are a part of your soul. Likewise, endurance running changes you forever, and if you’re lucky you get to do it until the day you die, too. That’s what I’m shooting for. Kathrine Switzer, the first woman to run the Boston Marathon wearing a bib number in 1967, once wrote that marathons are a secret weapon in your mental arsenal. If that trues, I’d argue that ultra are like imploding a nuclear bomb. Few things can stop you once you’ve set one off in yourself. Although it still challenges me, I fulfilled that promise to myself at Bear Chase. Somewhere between miles 19 and 23, when I most wanted to quit but choose not to, I tossed out my glass slippers. I traded up for trail running shoes. I am so grateful. “Karma” is probably the best word to describe my race at Bear Chase; specifically, a tsunami of good karma that hit me. Marathon Maniacs was my reason for running two marathon (or marathon-plus) distances this season. And Marathon Maniacs was also my reason for doing it despite an injury I’ve been battling. A few weeks before the Fox Valley Marathon (Sept. 16) I saw a podiatrist and was diagnosed with metatarsalgia. I talked to my doctor about whether or not I should run my races. He told me that I’d probably get through it and not cause worse damage to my foot but it would be very painful. At the time I saw the doc, I wanted to drop out of both races to heal the injury, and attempted to reverse course. I wrote the Fox Valley race director and requested to change races. He wrote back, stating they had a no-change policy unless you bought a “Weather Flex” policy at the time of registration. I didn’t so I faced a tough choice. Gut out 26.2 miles or switch races unofficially and take a DNF. 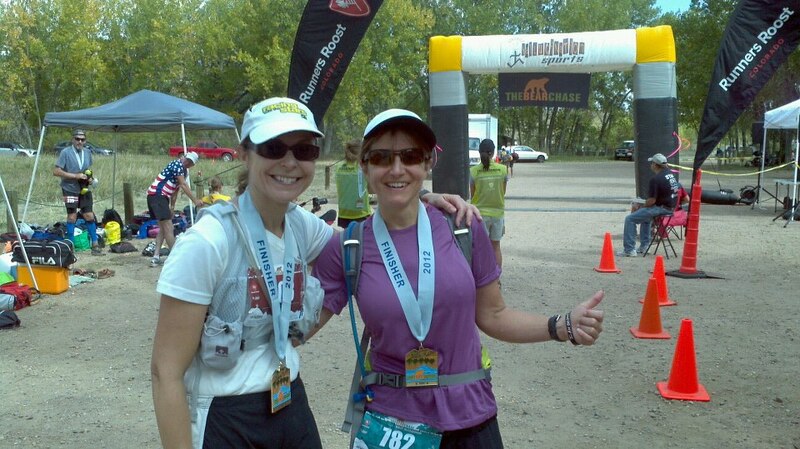 My second stroke of good karma at Bear Chase was my friend Paula, who, at the last minute, signed up for the 50K. She and I ended up running together. Paula was my guardian trail angel. Without her, my old Cinderella self might have messed with my head. But because of Paula’s friendship, company and strength, “Cindy” didn’t stand a chance. 2) Practice better fueling, specifically for ultras and that distance. Bear Chase is a great course — lots of rolling meadows, a few steep climbs, three stream crossings, and a stretch that open and exposed but still beautiful. 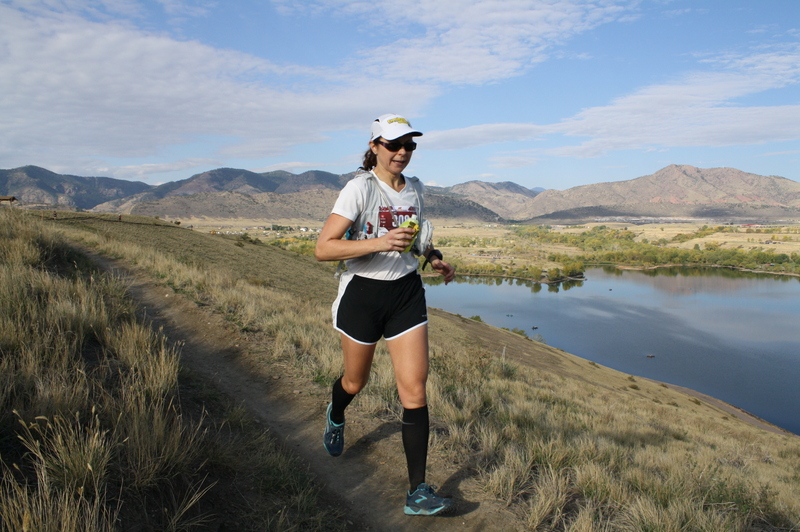 The 50K was set up in three segments — a fairly flat 10K in a meadow-like area; and then two loops where you go through meadows and rolling hills; hug the curve of the lake and dam; up Mt. Carbon and then down; through three, knee-high stream crossings; adjacent to the golf course nearby; back on trails and up more hills; and through exposed, open stretches. I finished in 7:01, and I’ve already made up my mind. I am going back. I know I can do better and run it faster and stronger. My injury — elephant foot — was worse after Fox Valley. It was starting to heal about the time I did Bear Chase. It’s still jacked up now but more of Dumbo foot. It’s healing slowly but surely. Yes, I am finally babying it — no more crazy races or distances until it’s completely healed. I am resting and water running for a few weeks to heal it. It’s time for me have some fun writing and finishing the women’s Boston or Botox profiles, plus add more good things to this blog. Who knows what the next decade will bring?! I can hardly wait. Addendum: I wanted to add just a few more details about how the race technically. The first 10K Paula and I kept a decent pace and even into the next section (first lap of 12.5 miles) I felt strong. Crossing that finish was one of the best feelings I’ve had in a long time — woohoo! !